Republicans Praise, Democrats Grill Andrew Wheeler In EPA Chief Confirmation Hearing Wheeler has been serving as acting EPA administrator since Scott Pruitt stepped down amid ethics scandals in July. Prior to his work at the EPA, Wheeler worked as a lobbyist for the coal industry. Andrew Wheeler arrives Wednesday to testify at a Senate Environment and Public Works Committee hearing to be the administrator of the Environmental Protection Agency. 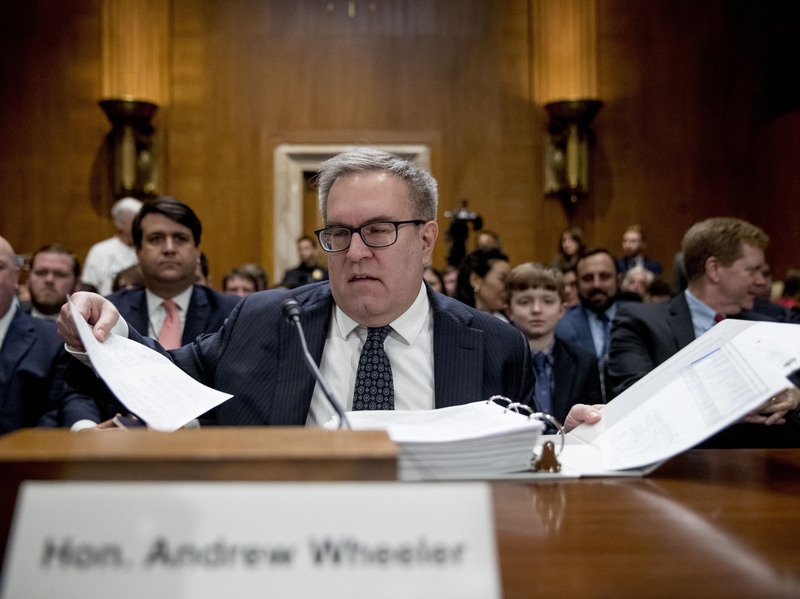 Andrew Wheeler, a former coal lobbyist who has been serving as the acting EPA administrator since July, faced Senate lawmakers on Wednesday for his first confirmation hearing to lead the agency. He defended his record on rolling back Obama-era environmental regulations as Democrats assailed his ties to business and his lack of urgency on the issue of climate change. "The Trump Administration has proven that burdensome environmental regulations are not necessary to drive environmental progress," Wheeler said. "I am very proud of the work I did." Wheeler has been serving as acting director of the EPA since Scott Pruitt resigned amid ethics scandals that included using agency funds inappropriately for an outsize security detail, luxury travel and a $43,000 soundproof room, among other allegations. Massachusetts Democratic Sen. Ed Markey tore into Wheeler after the acting administrator claimed he had not formed an opinion on an assessment put out by 13 U.S. government agencies, including the EPA, that showed global warming will cause significant damage to the U.S. economy. "We have several briefings scheduled before I can make further public comments," Wheeler said of the assessment, which was published in November. "That's unacceptable," Markey replied. "We're having a hearing on your worthiness for this job and you very conveniently haven't had enough time yet to review whether or not there's an extra level of urgency to this problem." Democrats, who hold a minority in the Senate, have little chance of blocking Wheeler's confirmation. Nevertheless, they targeted their questions at what they see as Wheeler's shortcomings in carrying out the Environmental Protection Agency's core mission. Vermont independent Sen. Bernie Sanders, who typically caucuses with Democrats, asked Wheeler if he agreed with the scientific community "that climate change is a global crisis that must be addressed in an aggressive way." "I believe climate change is a global issue that must be addressed globally," Wheeler answered. "How does it happen that the nominee to be head of the Environmental Protection Agency does not mention the words 'climate change' at a time when the scientific community thinks that climate change is the great environmental crisis facing this planet?" Democrat Sen. Sheldon Whitehouse, of Rhode Island, took Wheeler to task about a meeting he held with coal executive Robert Murray and Energy Secretary Rick Perry in 2017. Despite Wheeler's "polite and professional demeanor," Whitehouse added, "I continue to believe that you have your thumb, wrist, forearm and elbow on the scales in virtually every determination that you can in favor of the fossil fuel industry, and I think that is very unfortunate." Pruitt, the former attorney general of Oklahoma, shared Wheeler's pro-business approach. However, Wheeler has had more experience at the EPA and in Congress. He began his career as a special assistant in the EPA's Office of Pollution Prevention and Toxics under President George H.W. Bush, report NPR's Rebecca Hersher and Colin Dwyer. Wheeler also worked as a staffer on the Senate Committee on Environment and Public Works, the same body conducting his confirmation hearing. After that, Wheeler served as an aide to Sen. James Inhofe, R-Okla., one of the most vocal climate change skeptics in Congress. Then he entered the private sector, where he lobbied for coal, chemical and uranium companies. Protesters heckled Wheeler as he made his opening statement. One shouted, "This is outrage. Shut down Wheeler, not the EPA." Wheeler defended his agency's work in limiting the federal government's oversight over states' water resources. He boasted of allowing states to set their own emissions standards for energy, rather than adhering to the nationwide Clean Power Plan unsuccessfully advanced by Obama. And he told senators the EPA's new Safer Affordable Fuel-Efficient (SAFE) Vehicles rule would help lower the cost of vehicles. Republican lawmakers appeared to give Wheeler their blessing. Committee Chairman Sen. John Barrasso, R-Wyo., thanked Wheeler for withdrawing an Obama-era rule on water monitoring. He said of Wheeler, "He will be a reasonable voice within the agency." Republican Sen. Kevin Cramer of North Dakota nodded to Wheeler's experience when he asked, "Should we bar farmers from being the head of the Department of Agriculture? Should we bar doctors from being the head of Health and Human Services or attorneys from being the attorney general or bankers from being the head of the Treasury Department?" Sen. Dan Sullivan, R-Alaska, elicited a pledge from the nominee to work on limiting plastic pollution in seas. Sullivan noted that United Mine Workers of America have praised Wheeler. Wheeler's confirmation hearing took place as the government is in its longest shutdown ever. Some 13,000 employees in the agency have been furloughed; another 891 remain on the job. Maryland Democratic Sen. Chris Van Hollen asked Wheeler if he would urge Trump to sign a bill to fund the EPA and put his agency's employees back on payroll. Wheeler declined. Environmental groups have called for Wheeler to be rejected. "Time and again, Wheeler has demonstrated just as much loyalty to polluters and just as much commitment to reining in the EPA's crucial work on clean air, clean water, toxics, and climate action, along with supporting the Trump administration's proposals to slash EPA staff and starve its budget," wrote Ana Unruh Cohen, managing director of government affairs at the Natural Resources Defense Council. Citizens for Responsibility and Ethics in Washington has filed an ethics complaint regarding Wheeler's overseeing of rollbacks in regulation that benefited the coal industry and other industries he lobbied for. The Associated Press reports that EPA Spokesman John Konkus called that charge "baseless."